The UK experienced a show-down on the EU during the past two weeks. Nick Clegg, Deputy Prime Minister and leader of the Lib-Dems, debated against the Europhobic Nigel Farage, leader of the UK Independence Party (UKIP). The UK is known for its anti-European sentiments and Eurobarometer polls show the UK consistently on the last places in any kind of enthusiasm for the EU, only sometimes topped now by countries that have to implement austerity measures. The two debates demonstrated another time why the UK is very much at the edge of EU. The only leader of an established political party who declares himself openly as pro-EU failed to demonstrate why the EU matters. According to non-partisan polls, almost 70% of the viewers said after the second debate that they thought that Farage had won the debate. Only among the young voters under 25 the two had an equal showing in the polls. 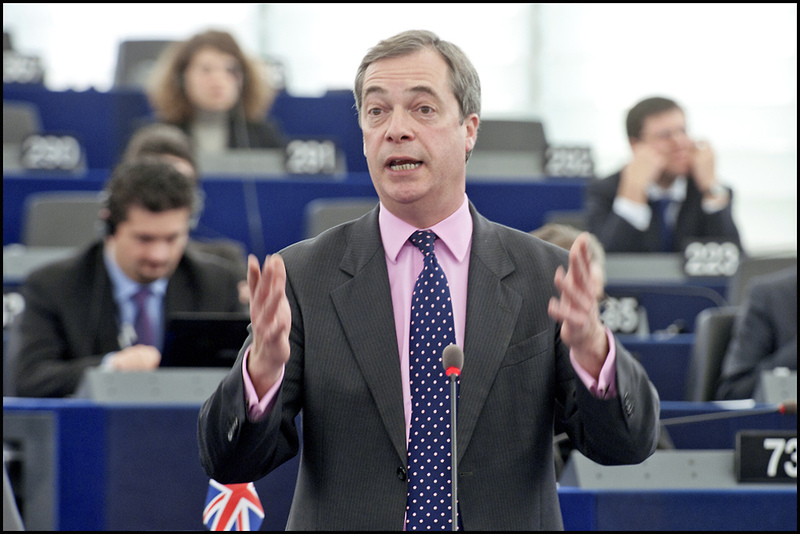 However, it was not so much a victory against Clegg, Farage rather demonstrated that UKIP has all the potential to make the race against the Tories and Labor at the end of May 2014 in the European Parliament elections. It will strengthen the forces that work destructively in the European Parliament instead of changing things to the better. From the beginning it was clear that two different world views would clash. On the one hand there was Farage who is infamous in the European Parliament where he is a member since 1999 – although he wants to get rid of this very institution and gets the UK out of the EU. Moreover, he does not believe in climate change and has verbally supported Putin in the ongoing crisis with the Ukraine. On the other hand you have Nick Clegg who came in as the underdog into the last general elections in the UK and is now Deputy Prime Minister in a coalition with the Tories. He is outspokenly pro-EU although he fails to create any enthusiasm among Britons for the EU. During the first debate on LBC, both tried to stay rather calm. Basically all analysts saw Farage ahead, although not by a big margin. As political analysts criticized that Clegg did not show enough emotions, he clearly has over-done it in the second debate televised on the BBC. In short, @JGForsyth commented on Twitter that the “biggest sign of how much politics have changed, it was Clegg was playing the challenger and Farage the incumbent.” Clegg tried to attack Farage with cheap jokes but without being able to make a case for the EU. Thus, by all means, Clegg did not make it. He was not able to make a point besides some numbers why the EU should matter to the UK and its citizens. Tories (David Cameroon) and Labour (Ed Miliband) refused from the beginning to debate with Farage. For good reasons, because Cameroon never had good performances in TV debates and Miliband has no stance on the EU, fearing that either position would shy away voters. This is certainly not a position of strength. Therefore, #NickvNigel was not a debate to convince voters from the other side. Rather, Clegg tried to gather more pro-European votes and Farage tried to build up even more pressure on Cameroon. Indeed, the British Prime Minister is scared of Farage and his showing in the polls that moves Cameroon ever more to the right. The voices in the backbenches of the Tories are ever more pressing that the UK should leave the EU. Moreover on immigration and the freedom of movement, the Tories have moved considerably to the right. Clegg missed out an opportunity to show to the British public why the EU matters. Quite a shame indeed. Clegg did not perform against a political clown, because that was Farage certainly is. Indeed, a miserable failure. Who or what else might convince Britons that the EU matters to them?